Every good manager recognizes a certain skill-set or a certain aptitude within an individual; a great manager is able to position that individual in a way which brings those skills and abilities to the forefront and puts them to good use. This is what all business owners want; a well-drilled, keenly-honed team, each member of which has the unique attributes required to succeed. Unfortunately, this is not always the case. Instead, projects are often assigned on an impersonal basis, with each new element delivered to the next available team member. This approach does not take into account the unique nature of each project, the strengths of each team member and team, or the scale of the work required. 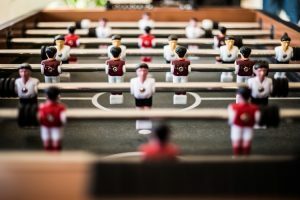 The result – more often than not – is that some teams get the luck of the draw with a series of shorter projects and spends the remaining five or ten hours of each week out of action, while other teams are forced into overdrive in order to get their projects completed. The knock-on effect of this imbalance is wasted spending on inactive employees, and substandard results from the overworked employees. This can be combated by adopting a more personal and considered approach to project management, ensuring that the right projects are matched up with the right teams. This also helps to balance the workload, boosting efficiency and quality across the board. In the end this can help your company save your most valuable resource (your people) from burning out too quickly. Management and ownership should be particularly aware to employees clocking in large amounts of overtime and therefore working extremely long weeks. This level of work does not help the organization in the long run, it is unsustainable for the individuals involved, and often leads to worker or team burnout. Instead, the employee simply becomes disaffected with life in the organization, leading to a reduction in work quality and the potential loss of a highly valued and skilled employee if they decide to leave. The management techniques mentioned above enable organizations to keep themselves well-informed of the amount of work their employees are taking on. A healthy, safe and sustainable environment must be fostered in the workplace, and this applies as much to the number of hours worked as to the manner in which the work is carried out. If you identify with any of these three scenarios, you could be unknowingly leaking profits. By keeping a close eye on expenditure, on hours worked and on accurate invoicing, you are shoring up the profits of your organization and protecting them from harm. Software that enables you to track time and expenses within your organization as accurately as possible and manage your project resources effectively and efficiently is the first step in gaining these valuable insights.